You can add underlines to a financial report to set off and clarify calculations and use a variety of formatting techniques to draw attention to individual columns, rows, and cells in a financial report. As in other WebFOCUS reports, certain formatting features can be triggered by conditions that you define. You can also drill down to another procedure or a URL from a cell or column in a financial report. For details about conditional formatting and drill-down procedures, see the Creating Reporting Applications With Developer Studio manual. 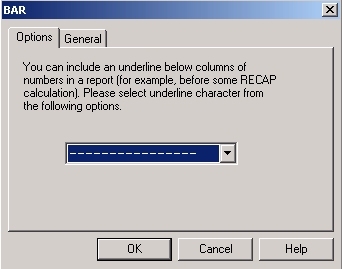 Reports that display columns of numbers frequently need to use underlines before calculations. You can specify a single or double underscore character in a BAR row. Select the row in which you want to add an underline. Click the Bar icon on the toolbar. Right-click anywhere in the row (except on the label) and select Change Type to, and then Bar. The BAR dialog box opens. The default BAR character is a single dash (-). To change the dash character, choose the double line (=) from the drop-down list on the Properties bar. Note: In HTML reports, the double line appears as a single thick line. BAR appears in the Row Type column. The selected symbol appears under columns that contain numeric data. You can choose a single or double line. Single is the default. Note: The double line is not clearly distinguishable in an HTML report and appears as a thicker single line. You can apply a wide range of formatting options to individual columns, rows, and cells in a financial report using options on the Field Properties Style tab. For columns, by identifying the column title and column data as separate objects for styling. For rows, by identifying the row and title as separate objects for styling. If you style a row and then a cell within that row, the cell styling takes precedence for the cell. If you style a column and then a cell with that column, the cell styling takes precedence for the cell. If you style a cell, then style a row or column that the cell is in, the cell style will remain the same. You can select an entire row by clicking the row label (R1, R2, R3, and so on) and then style that row using the font toolbar. For example, clicking R1 will highlight all entries in that row. While the row is highlighted, changing the font color to orange will result in every entry in that row having its font color changed to orange. Row and cell styling options are specific to financial reports created in the Financial Report Painter. Column styling options are identical whether applied from the Financial Report Painter or Report Painter. Right-click a column and choose Options from the context menu. The Field Properties dialog box opens at the Style tab. Select Column Title and Data as the active object, or select Column Data or Column Title to style them separately. If you have already styled either the title or data for a column and wish to quickly apply the same formatting to the other element, click the appropriate button: Copy Title Style to Data or Copy Data Style to Title. Under Column Layout, you can change column width and justification. Sets the width according to the length defined in the field format. Sets the width of the column according to the widest value or heading in the field. This is selected by default. Enables you to specify where to truncate the column width based on the specified units (inches or centimeters). To indicate that a field value has been truncated in the browser, WebFOCUS places an exclamation point (!) after every alphanumeric and text field value and an asterisk (*) after every numeric field value. Enables you to specify where to wrap data based on the specified units (inches or centimeters). Justification options are: left, right, center, or return to the default positioning. Enables you to select the present hidden option. This determines the columns that will be hidden from view in the report output, when using the HTML active report output format. For borders, click the Select Borders button. The Borders dialog box opens. Select width, style, and/or color options from the drop-down lists. You can apply the same specifications to all border lines or vary specifications for top, bottom, right, and/or left borders. Note: To set borders in an HTML report, Cascading Style Sheets must be on. Click Features from the Report menu. The Report Options dialog box opens. Ensure that an HTML styled report format is selected and verify that Cascading Style Sheets is checked. When Borders is selected, Grids is disabled. For grids, click the Select Grids button. Select a line style and indicate whether to display horizontal lines, vertical lines, or both. This option applies to columns in PDF reports but does not apply to columns in HTML reports. When Grids is selected, Borders is disabled. For fonts, click the Select Fonts button. The Fonts dialog box opens. Select font name, font style, font size, and/or color. For background color, click the Single Color option button under Background Coloring, and choose a color from the palette. If you identify the active object as column data, the Alternating Background Colors button is activated. You can use this feature to assign colors to alternating rows in one or more columns. Click OK to return to the Style tab. Under Applying to condition in the Style tab, you can define or edit a condition that controls when specified formatting options are applied to one or more columns. Click OK to return to the matrix where many styling changes will be reflected. Click the Run icon on the toolbar to see the column formatting options applied in the report output. Drill Down tab to drill down to another procedure, a URL, or another supported option. General tab to change the column title or field format, to make the column visible or invisible in the output, or to activate other features. This example uses the joined data source files, CENTGL and CENTSYSF (see Sample Data for FML Hierarchy Examples), and takes as its starting point the request created in Displaying One Summary Line for an FML Hierarchy. However, instead of applying a predefined stylesheet, as you did in the earlier example, you will be formatting the report yourself. You will apply bold formatting to each column title, data visualization bar graphs to a numeric column to help you quickly visualize trends and relationships in your data, and conditional styling to the data in a second numeric column. If you completed the referenced example, reopen the Design matrix. Click the Report Option button on the toolbar, and in the Style tab, click the Style File Selection button to open the StyleSheet File Selector. Click the Add new item button, select deflt.sty, and click OK from the StyleSheet File Selection dialog box. Click Finish and OK to apply the selected StyleSheet. If you did not complete the referenced example, follow those instructions up to step 13, then return here. Click the Report Option button on the toolbar and select the Output tab. Make sure that HTML is the selected Display format and that Cascading Style Sheets is turned on. You will need this feature of HTML to display the data visualization graphs. Click OK to return to the matrix. Right-click the Month Actual column and select Options from the menu. The Field Properties dialog box opens at the Style tab. Make Column Title the active object. Click the Select Font button and choose Bold from the Font Style box. Click OK. The column title, Month Actual, becomes bold in the matrix. Repeat steps 3-6 for YTD Actual, then click the Field Properties General tab. Click the Visualize button. The Data Visualization dialog box opens. Click the Visualize check box and select RED from the Color drop-down list. Click OK. YTD Actual becomes bold in the matrix. You will not see the effect of the data visualization graphics until you run the report. Click the Run icon on the toolbar. Suppose that you want to highlight Monthly Actual Values that are less than 100,000. In the Design matrix, right-click the column title Month Actual and choose Options from the menu. The Field Properties dialog box opens at the Style tab. The active item is Column Data. You will now define a condition to control the styling of this data. Click the Edit Condition button. The Condition List dialog box opens. Click New. The Edit Condition dialog box opens. Accept the default condition name, COND0001. Select NAT_AMOUNT from the Fields box, is less than from the Relation drop-down list, and enter 100000 in the Values box. Click OK. The Condition List dialog box shows your entries. If they are correct, click OK again to return to the Field Properties dialog box at the Style tab, where you will define the style you want to apply when the condition is met. Click the Font button. The Font dialog box opens. Choose Bold from the Font Style list and click OK. Notice that your selection is reflected in the Sample box. Right-click a row label (either a default label like R1 or an explicit row label that you have assigned) and select Options from the context menu. The Field Properties dialog box opens at the Style tab, with Row identified as the active object. 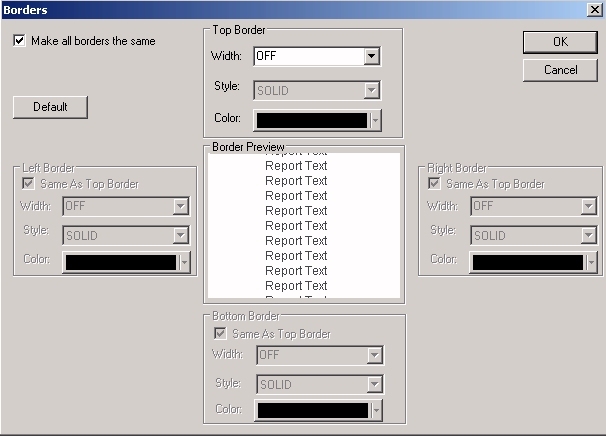 Under Graphical, at the right of the Style tab, select the font characteristics, border characteristics, and/or background colors that you wish to apply to the row. For borders, click the Select Borders button. The Borders dialog box opens. Select width, style, and/or color options from the drop-down menus. You can apply the same specifications to all border lines or vary specifications for top, bottom, right, and/or left borders. Click OK.
For fonts, click the Select Fonts button. The Fonts dialog box opens. Select font name, font style, font size, and color. Click OK.
For background color, click the Single Color option button under Background Coloring and choose a color from the palette. Click OK.
Click OK to return to the Design matrix where many styling changes will be reflected. Click the Run icon on the toolbar to see the row formatting options applied to the report output. The following are examples of formatting rows using the design matrix. The following example places a thick dashed border around the RECAP row identified by the label TOTCASH. Create the report using the sample data source Ledger. In Report Painter, designate Account as the For field and Amount as a Sum field. Above the matrix, select the Use Multiple Values check box to provide optimal flexibility in reusing tag values (although in this illustration you will use each value only once). Drag the tag values 1010, 1020, and 1030 onto the matrix. Right-click each value and choose Row Properties. The TAG dialog box opens. Click the General tab and assign the labels CASH, DD, and TD to rows R1, R2, and R3, respectively. Click OK after each entry. Create a RECAP row that totals the values of rows CASH (R1), DD (R2), and TD (R3). One way to quickly create a row for this simple type of calculation is to place your cursor in a column that contains numeric data and highlight the values you want to add. Then click the Make RECAP (Rows) icon on the Design toolbar to create the RECAP row. A formula representing the sum of the highlighted values (identified by their row labels) appears in the new row, in the column that contained the values. For information about creating more complex RECAP expressions, see Performing Inter-Row Calculations. Select Styling from the Report menu. The Report Options dialog box opens at the Style tab. Click the Style File Selection button. Click the Add new item button, select deflt.sty, and click OK from the StyleSheet File Selection dialog box. Click Finish, then click OK to apply the selected StyleSheet. This will add some basic styling to your report. Right-click the row label TOTCASH and select Options from the context menu. Click the Select Borders button under Graphical options. The Borders dialog box opens. To apply the same specification to the top, bottom, right, and left borders, leave the Make all borders the same check box selected. Select Medium from the Style drop-down list. Select Dashed from the Style drop-down list. Click OK to return to the Style tab and OK again to return to the Design matrix. Notice that the dashed border has been placed around the entire row. The gray background is applied by a default style template that you selected in step 6. In the following variation, specifications are applied separately to the top, bottom, left, and right border lines. A heavy black border line is placed above and below the RECAP row. A thinner dotted line is placed to the left and right of each column in the row. Once again, right-click the row label TOTCASH and select Options from the context menu. Select Heavy from the Width drop-down menu. Select Solid from the Style drop-down menu. In the Bottom border box, click the Same as Top Border check box. In both the Left and Right Border boxes, specify Width as Medium and Style as Solid. The following procedure is an example of applying boldface to a free text row. Create the report using the sample data source Ledger. In Report Painter, designate Account as the For field, and Amount as a Sum field. In row R1, right-click in the Row Type column. Choose Change type to from the context menu, and select Text. The TEXT dialog box opens. Type ---CASH ACCOUNTS-- in the input box, then right-click in the Label column of row R1 and select Options. The Field Properties dialog box opens at the Style tab. Under Graphical, click the Select Font button. The Fonts dialog box opens. Select Bold in the Font Style list and click OK. Click OK again to return to the matrix. Drag the tag values 1010, 1020, and 1030 onto the matrix. Right-click in the Row Type column for tag 1010 and select Row Properties. When the TAG dialog box opens, click the General tab and enter the title CASH ON HAND in the Title input box. Repeat steps 6 and 7 for tags 1020 and 1030, using the titles DEMAND DEPOSITS and TIME DEPOSITS, respectively. In row R5, right-click in the Row Type column, choose Change type to from the context menu, and select Text again. This time leave the input area in the Text dialog box blank to create an empty text row. It will appear as a skipped line in the report output. In row R6, create a third text row and type ---OTHER CURRENT ASSETS--- in the input area of the Text dialog box, then right-click in the Label column of row R1 and select Options. The Field Properties dialog box opens at the Style tab. To apply boldface to this text row, follow the instructions in step 5. To complete the report, drag the tag values 1100 and 1200 into rows R7 and R8 on the matrix and enter the following row titles for tags 1100 and 1200, ACCOUNTS RECEIVABLE and INVENTORY, respectively, in the TAG dialog box. The Financial Report Painter identifies a free text row with a row label designation. The following procedure describes how to format a cell in the Design Matrix. Right-click a cell and choose Options from the context menu. The Field Properties dialog box opens at the Style tab, with Cell identified as the active object. For borders, click the Select Borders button. The Borders dialog box opens. Select width, style, and/or color options from the drop-down menus. Click OK.
For fonts, click the Select Fonts button under Graphical options. The Fonts dialog box opens. Select font name, font style, font size, and color. Click OK.
For background color, click the Single Color option button under Background Coloring, and choose a color from the palette. Click OK. Under Applying to condition, you can define or edit a condition that controls when specified formatting options are applied to a cell. Click OK to return to the Design matrix, where most formatting changes will be reflected. Click the Run icon on the toolbar to see the cell formatting options applied in the report output. Note: To drill down from the selected cell to another procedure or to a URL, click the Drill Down tab. For details, see Formatting Columns, Rows, and Cells. Although certain options on the General tab are enabled when cell is the active object, these options will be applied to the entire column, not only to the selected cell. The Field Properties General tab options are available for the following fields in the Design Matrix. Set Title and Output options are available for the FOR field in the Design Matrix. All options (except Table of Contents) are available for SUM and DETAIL fields in the Design Matrix. The following example places a solid line of medium thickness around a cell in the RECAP row identified by the label TOTCASH. Create the report using the sample data source Ledger. 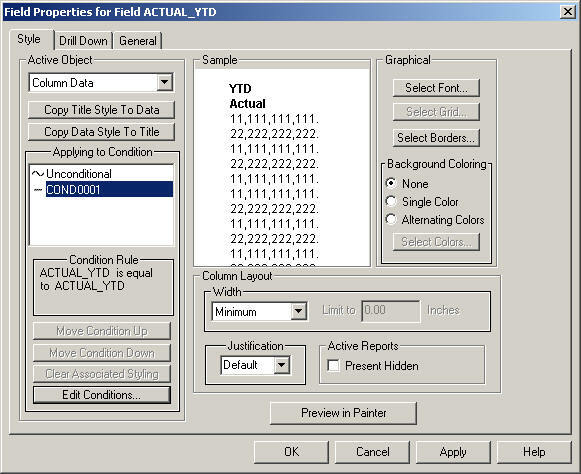 In the Report Painter, designate Account as the For field and Amount as a Sum field. Above the matrix, click the For Multiple button to provide optimal flexibility in using tag values (although in this illustration you will use each value only once). Drag the tag values 1010, 1020, and 1030 onto the matrix. Notice that the tag values appear in the Title column. To provide more meaningful titles, either type the following entries into the cells on the matrix or open the TAG dialog box and enter the new titles in the General tab. Replace 1010 with CASH on HAND, 1020 with DEMAND DEPOSIT, and 1030 with TIME DEPOSIT. In row R4, right-click on the Row Type column, choose Change Type to, and then Bar. The BAR dialog box opens. Click OK to confirm the default underline character. The underline is displayed in the Amounts column, below the values to be summed. In row R5, create a RECAP row that totals the values of rows R1, R2, and R3. Click OK.
One way to quickly create a row for this simple type of calculation is to place your cursor in a column that contains numeric data and highlight the values you want to add. Then click the Recap icon on the Design toolbar to create the RECAP row. A formula representing the sum of the highlighted values (identified by their row labels) is displayed in the new row, in the column that contained the values. For information about creating more complex RECAP expressions, see Performing Inter-Row Calculations. Change the Title for the RECAP row to TOTAL CASH. Right-click the cell that contains the RECAP formula and select Options from the menu. The Field Properties dialog box opens at the Style tab, with Cell identified as the active object. Click the Select Borders button under Graphical options. The Borders dialog box opens. Select Medium from the Width drop-down list. Select Solid from the Style drop-down list. Right-click the same cell and choose Options again. Click the Select Font button and choose Bold from the Font Style list. The bold font style and solid border draw attention to the Total in the Amount column. Right-click the cell in the Design matrix and select Options from the context menu. The Field Properties dialog box opens at the Style tab. Click the Edit Conditions button. The Condition List dialog box opens. The Edit Condition dialog box opens. Type a name for the condition or accept the default. Select the field for which you want to define a condition from the Field box. Select a relation from the Relations list. Type a literal value in the Value box. Click the Values button to display existing database values and select a value. Click Another Field to display other fields in the report and select a field. The condition is added to the Condition List in the Condition List dialog box, from which it can be applied to one or more cells, as well as to columns or rows. Tip: To create another condition, repeat steps 4 to 10. Click OK again to return to the Style tab on the Field Properties dialog box. The default condition name (for example, COND0001) appears in the Applying to Condition field box. The condition you created appears in the Condition Rule box. You are now ready to associate the condition with a style. Select a defined condition from the Applying to Condition dialog box in the Style tab. Click the Select Font button to specify conditions such as font, font style and size, color and effects. Click the Select Grid button to select a line style (only for PDF reports). Click the Select Borders button to select line style, width, and/or color options from the drop-down menus. In the Background Coloring area, click the Single Color option button to select a background color. Any type of executable object, such as a report or graph. A link to a Maintain case (function). A link to a Maintain procedure. ENGLAND, to view a more detailed report on the sales of all English cars. JAGUAR, to see specific sales information on the Jaguar. A summary report row, to view the values behind each field in the row. From either Report Painter or the Financial Report Painter, you can drill down from a column title and its data, or from the title only, or the data only. In addition, from the Financial Report Painter you can drill down from a single cell in the matrix or from a row or row title. These behaviors are invoked from the Field Properties Drill Down tab. The active object box indicates the matrix element from which the drill down will be implemented. The Drill-Down Definition indicates what you want to drill down on: a URL, a procedure, or one of the other supported options. Notice that you can also define conditions that determine when to run an embedded drill-down procedure. For example, suppose you have embedded a procedure in the country column of the summary report, but you want your drill-down report to appear only for England. You can define a condition that enables the embedded drill down only when country equals England. The mechanics of establishing a drill-down relationship are the same, regardless of the active object you choose. For details about this process, see the Creating Reporting Applications With Developer Studio manual. For a column, right-click the column title. If you select Options from a column title, Column and Title is the active object. However, you can change the active object to column title or column data. For a cell, right-click the cell, then choose Options from the context menu. The Field Properties dialog box opens. Click the Drill-Down tab. If you select Options from a cell, Cell is the active object. However, you can change the active object to column and title, column title, column data, row title, or row data.